A poignant and hilarious film that reverses the coming of age formula, creating a beautifully honest portrayal of life with its rough edges, awkward moments and non-endings. Starring Golden Globe winner David Duchovny, Oscar-nominated actress Vera Farmiga, Emmy winner Ty Burrell, Golden Globe winner Keri Russell. 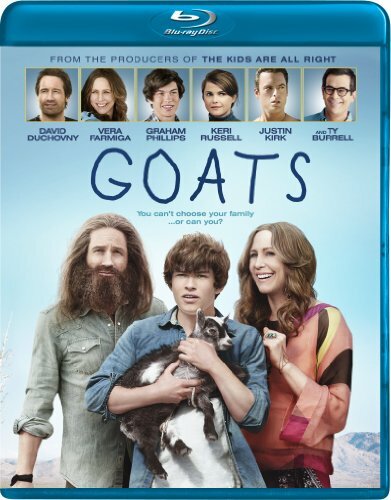 Chatsworth, CA - On September 11th, Image Entertainment brings you Goats , a poignant and hilarious film that reverses the coming of age formula, creating a beautifully honest portrayal of life with its rough edges, awkward moments and non-endings. Starring Golden Globe(R) winner David Duchovny ("The X-Files", "Californication"), Oscar(R) nominated actress Vera Farmiga (The Departed, Up in the Air), Emmy winner Ty Burrell ("Modern Family"), Golden Globe(R) winner Keri Russell ("Felicity"), Golden Globe nominee Justin Kirk ("Weeds") and Graham Phillips ("The Good Wife") in a breakout role, Goats comes to Blu-ray(TM) for an SRP of $29.97 and DVD for an SRP of $27.97. Pre-book is August 14th. The film, from the producers of The Kids Are All Right, is based on a novel by Mark Jude Poirier and directed by Christopher Neil. The all-star cast also includes Justin Kirk ("Angels in America," "Weeds," "Animal Practice"), Anthony Anderson ("Law & Order," "Guys with Kids") and Dakota Johnson ("Ben and Kate", 21 Jump Street). At 15 years old, Ellis (Graham Phillips) is the most adult member of his eccentric family. His mom (Vera Farmiga) is a New Age hippie that spends all of her time working on self-help rituals with her hustler boyfriend (Justin Kirk). His dad (Ty Burrell) left home years ago and is more focused on his new wife (Keri Russell) and family. And then there's Goat Man (David Duchovny), the goat-herding sage who has lived in their pool house since Ellis was a child, teaching him the meaning of stability, commitment, and expanding one's mind. When Ellis decides to leave Tucson to go to the same East Coast prep school that his father went to, he easily assimilates to his new environment - even gaining the attention of a local girl (Dakota Johnson). But as he re-connects with his estranged father, he finds Goat Man's influence and his life out West thrown into stark contrast. Image Entertainment, Inc. is a leading independent licensee and distributor of entertainment programming in North America, with approximately 3,700 exclusive DVD titles and approximately 300 exclusive CD titles in domestic release and more than 550 programs internationally via sublicense agreements. For many of its titles, the Company has exclusive audio and broadcast rights, as well as digital download rights to approximately 2,600 video programs and approximately 400 audio titles containing more than 5,600 individual tracks. The Company is headquartered in Chatsworth, California. For more information about Image Entertainment, Inc., please go to www.image-entertainment.com.